shared in a most beautiful way. We journey forward, from this point forward. helping one another dispel fears. two Southern women: The Bee’s Knees! This week, I had the opportunity to meet Dana, the beautiful soul behind Love letters lost at Sea. We met for breakfast and stayed through lunch. The company, food& weather were great! She & I discovered that we have a lot in common. To my surprise, I even got to meet Adam. We penned a poem or two. I absofuckinlutely love that you guys got together like that. Thank you! Glad you enjoyed it! I so want to make it out to Asheville, still. I am confident in that, for sure! Wish it were closer. My car trip to Raleigh was pressing my limits. “in my old age” i don’t seem to like to sit for too long…. Where are you at Tiffany? Meeting you was such a true joy … I think we could have spent many days/evenings together and never cover enough ground. You, my sweet friend, are more extraordinary in heart and mind than even your blog and words portray. And of course, your hotness can only be appreciated in person!!!! Love you!!! Dana, oh, yes! There are many whiskey bars here. One place even serves whiskey flights!!! ❤️ the beach beckons! Oh yes … I still must try Angel’s Envy!! Watch out! 😉 My next bucket list item to be conquered! Oh, now we’re takin’! Yes, she is such a nice treat. Booker’s is another to try. Whew!!! Yes, I’m looking forward to it! Have a safe trip back, Ken. Look out for those Great Blue Herons, ok?! What a lovely surprise. Two of my favs, sharing a page. Lovely! I think the friendships we create here are so powerful and important and Dana is the best friend you could ever hope for. I agree, Mr. M, re: friendships here. There is a certain freedom I’ve found here in expressing things that I can find challenging to express in person. Yes, Dana is a lovely soul. I knew it before I met her. In person, she shines even more. The words on our pages do not always express the depth of the person behind them. (I’m sure the inverse is also true, too). Have a great day! It’s beautiful here on the mid-atlantic! Yes, we wrote the piece together when we met for brunch earlier this week while I was visiting her city. 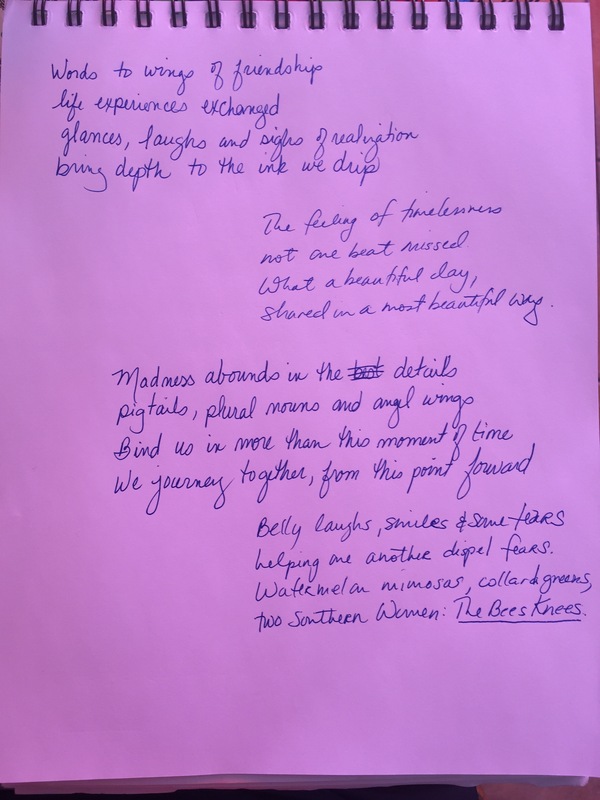 I mentioned it at the very bottom of the post, after the typed poem & I included a picture of our handwritten original poem from my journal/sketch pad. It was a great meeting & I’m sure we’ll meet again sometime, hopefully soon! Oh yes. I did see the handwritten poem. How lovely! Encourages me to travel more, too! How wonderful that you got to meet and spend time together! And the poem was awesome! Loved it! I’m sure that that is so. Smiles.